Rae Dawn Chong photo by Ernst Hass was scanned from an original portfolio set for Quest for Fire in the Northernstars Collection. Rae Dawn Chong was born in Canada but raised in Los Angeles. She began appearing on Canadian television when still in her preteen years. She is often remembered for her award-winning big screen debut as the mud-covered cave dweller Ika in 1981’s Quest for Fire. She played the role of DR.Peggy Fowler on 44 episodes of Mysterious Ways from 2000 to 2002. The image above and the poster below were scanned from originals in the Northernstars Collection. 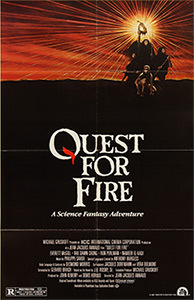 This poster for Quest for Fire was scanned from an original in the Northernstars Collection.